Chef Judy Joo isn’t your ordinary chef. In fact, there’s not much that’s ordinary about her. After getting her degree and finding her way to the Wall Street trading floor, she settled into a career in finance. After a few years, her passion for food proved to be too much and she gave up Wall Street to attend culinary school. A decade later, she’s an Iron Chef, an Iron Chef America host, restaurateur, cookbook author, and the host of her own cooking show on Food Network. 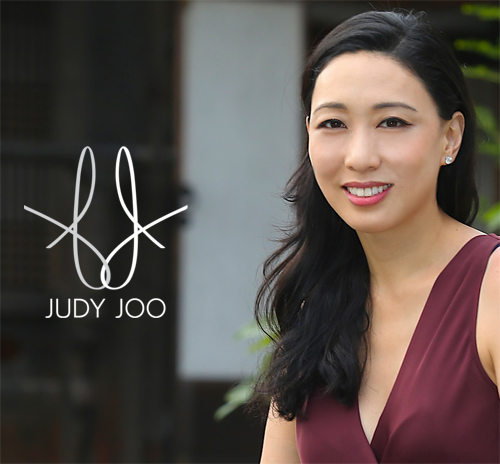 Meet Judy Joo. She took the path less chosen. Order Judy’s meal kits and enjoy her easy-to-prepare food at home. Heat the vegetable oil in a large skillet over medium-high heat, add the bacon and saute until the edges are crispy, 2 to 3 minutes. Using a slotted spoon remove the bacon from the skillet and letdrain on kitchen towels. Reduce the heat to medium and add the carrots and garlic to the skillet. Cook, stirring constantly, until carrots are just softened, 2 to 3 minutes. Then mix in the mushrooms, zucchini, 2 of the spring onions and the kimchi, and continue to saute until tender, 4 to 5 minutes. Return the bacon to the pan. Add the rice and mix to incorporate well using a wooden spoon to break up the rice. 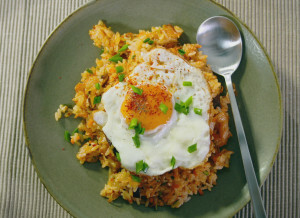 Transfer the fried rice to a serving plate or platter, top with the fried eggs andgarnish with the remaining spring onions and a sprinkle of Korean chile flakes and black pepper. Place the kimchi in a bowl and use kitchen sheers to cut it into small pieces. Kimchi can stain your cutting board and make it smell. Use the julienne blade on a mandolin or a julienne peeler to cut thecarrots and the zucchini. After making long thin pieces, use knife to cut down to small pieces. Music in this episode from SubFocus and Vo.